An alternate approach that may work for many (it does for us at the Denver Art Museum) is to simply point the iPhone at the external IP address / host name for Outlook Web Access. True, on the internal LAN you’re going to take a trip outside to get to the internal server, but it should always work. My exchange activesync is not pushing. I’m using the gen 1 iPhone but have the new softward. Is push for exchange only supported while on wifi or does it work via Edge as well? I have yet to see it actually push anything, it doesn’t update until I actually open mail or contacts or calendar etc. @Rob – it definitely works over edge…sounds like there might be some config problems on your Exchange Server? @MacITSolutions – I don’t think that will get around the problem of having different IPs for internal and external networks. Just stumbled across this discussion. Bruce’s original suggestion worked for us perfectly. Overriding the DNS on the WIFI setting to point to an external DNS server solves it. Thanks! Is there a way to get my work email, that normally goes to my blackberry via T-mobile Exchange, pushed to my iphone via AT&T without letting my work know? I had the same issue since I installed Exchange 07 and the external OWA address had changed. Once I figure out how to change that back to normal I should be ok, BUT: I followed the original suggestion about changing the DNS numbers. However, I did not use an “external” rather I used my internal router IP of 10.x.x.1, which already has the static DNS’s set up in the WAN settings. Question for Mac IT Solutions, how does this help and does he mean to do this on the primary DC or on the exchange server which is running OMA/Activesync? I’ll give it a try though I can’t see how this will help anything, mail server was resolvable it’s just push email that’s not working. I read on another forum that the reason that OMA push email works so well is down to the fact that exchange relies on the connections being slow between your iPhone and the server. I’d be interested to know if push email works over wireless for any phones. I can sync my email well enough over the wireless it’s just the push notifications I’m not getting. Anyway I’ve done what Mac IT solutions has suggested for now, maybe the Host A creates and authoritive answer for the iphone to go “oh I really am meant to be using this address not some external one”. Anyway thanks for the info guys. from the external www, I can access my server via the web no problem, internally, my dns resolves mail.domain.co.uk as the external address and does not work. How do I add an entry to the internal dns server to point to the internal address and not the external one? Thanks for the help. Worked perfectly. Just found this article after fighting with my new Iphone for a bit. Was exactly the issue, we have different external/internal IPs and I was on wifi. To bad I can’t change our network setup and will have to go without wireless while in the office. I had the exact same problem as the article author. His fix worked for me, but I modified it slightly to be able to continue to resolve internal names in my split-DNS infrastructure. My server is accessible at mail.mydomain.com. Externally that is 5.6.7.8, for example, but internally it is 1.2.3.4. Push was working externally, but not internally over wifi. To address the issue, which may be what MacIT was suggesting, I added an A record to my internal DNS pointing iphonemail.mydomain.com (a new name I just made up) to my external IP, 5.6.7.8 instead of the internal one. I added it externally as well. Now, iphonemail.mydomain.com resolves to 5.6.7.8 both internally and externally, so push works inside the LAN or on the internet. The benefit here is that I can still access my internal servers on the iphone while connected to my lan. As the author pointed out, this will only work for you if you can reach your external IP internally. I am using ISA Server 2006, if that helps. As Debello encountered, you also of course have to be able to add A records. @gregr, you are correct. I have a wildcard cert that I got from RapidSSL. They are only $199. So *.mydomain.com has been secured for quite some time. Wildcart certs NOW cost what REGULAR certs USED to cost! Totally worth it in my book. These dns solutions will only work if your router/firewall is configured to support NAT loopback. Some lower/mid-range consumer devices don’t support it at all. I am having a problem getting new contacts to push to my iPhone. When I setup my email it loads contacts, mail items, and calendar items perfectly. The Exchange Server also pushes calendar events and email over perfectly….. HOWEVER, it will not push NEW contacts over to my iPhone. ie: If I add a contact in Outlook, it does not push the contact to my iPhone. It DOES add the contact to my Exchange Server though. What is even more interesting, is that if I add a contact in my iPhone, it WILL add that same contact into my Outlook. If I add my contacts through the Webmail Exchange Server, it will add the contact to both Outlook and my iphone. How can I configure this properly so that when I add new contacts in Outlook it pushes it to my iPhone? One last thing, is that I am also not able to access my Global Address Book from my iPhone that sits within my Outlook. The option on my iPhone appears under the “Groups” in my “Contacts” but when I click on it there aren’t any names that appear. Any suggestions? I got around this issue in a different way and this information may be of help to some of you. So basically when on corporate Wifi mail.mycompany.com resolves to the internal IP and when external to the system it resolves to the external IP. You will have to create the other records for www and the like as your internal DNS server will think it’s responsible for the domain (even though it may really not be). mail.mycompanyname.com will be the server used in the Activesync configuration. @MK – your proposed configuration is exactly what _causes_ the problem I described. If you read the KB article I linked to, it calls out this configuration specifically as an issue. Hi, I found this website as i have had same issue as everyone else. When on LAN i can’t sync my Iphone 4.1 with the exchange server. Push does not work and error “Cannot Get Mail – The connection to the server failed”. 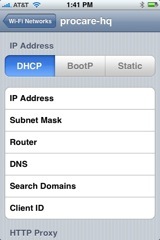 My setup is an Router which sits on 192.168.0.50 and the WAN DNS is set to Opendns IP address. I relized that the issue is down to DNS, suggestion to use the external DNS seems that it has not worked for me at all. I found that if i use the internal DNS which is 192.168.0.9 than the sync works just fine. I hope this helps somone who has the same issue. @MACIT, Worked well for me mate, was just missing the ptr, thanks for the help. I have read through some of this thread as my system has suddenly stopped doing the push thing to my iphones (3G running IOS 4.2.1) from yesterday after the server crashed. I have run through my server config and nothing has changed (Exchange 2003 running on 2003SBS SP1). So I still have some work to do! @MACIT worked great for me after I created a .pac file and set my proxy to auto (with a exception for local addresses) as I use a proxy server. MACIT, is there any specific reason why is failed when the I was using a DNS forwarder for the zone?